Today Spick and Span window cleaners went down to an educational building in Kennington south east London, where they were employed to clean internal windows located high-up in the main hall area of the building .The modern educational facility had very large glass panes put in it, approximately 30 ft. from ground level, by the building’s architect to allow maximum light to fill the hall, however glass this high is very difficult for on site cleaners to clean without having specialized high-level internal window cleaning equipment, hence the need to call professional window cleaners in. 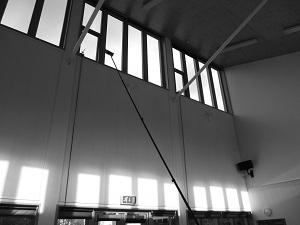 Spick and Span were able to clean the windows and at the the same time reduce the risk of water running down the panes and damaging paintwork while cleaning by using a purpose built mop-head attached to an internal window cleaning pad .This mop and pad was connected to a telescopic window cleaning , extended to around 25 ft.To lubricate the glass and clean the windows effectively purified water was applied to the pad , this helps attract the dirt from the glass. To ensure that the glass was cleaned thoroughly and that dirt and dust adhering to glass was removed, an up- and- down and side- to- side action was used, whilst applying pressure to the mop head, to clean all the marks away from the glass. After this window cleaning action had been repeated on all the large glass panels within the hall ,the panes were inspected, and a second stage of cleaning was performed. Upon completion of the glass cleaning in the main hall area of the college, there were noticeable differences after cleaning. Work then shifted to the reception area. Some of the windows in the reception/office had to first have some furniture moved before the windows could be cleaned . The windows were large paned floor to ceiling glass, these had marks and smears of various descriptions preventing light from entering into in. For instance a milky white chemical substance covered much of the glass, which was the leftover results of previous attempts to clean. After the window cleaner mopped a special window cleaning solution and squeegeed the glass panels, they were again translucent and clear to look through. Posters were carefully removed from the windows at the main desk, and sellotape marks were scraped off, particular care had to be taken that no water was spilled as the window cleaner worked close to computer equipment and power supplies. After the windows were all cleaned and detailing had been done furniture that had been moved to get to the windows was put back into the original position, and the job came to it’s completion.